Fine Homebuilding Magazine has defined stair and rail building as the pinnacle of the carpenters' trade. It combines the mathematical complexities of roof framing, with the exacting standards of furniture quality finish work. Furniture grade stairs and rail are an investment in quality, increasing home value and resale for many years. At Central Coast Stairs we pride ourselves on offering the highest level of craftsmanship at competitive prices, all the while providing honest, dependable, high quality service. Working with Central Coast Stairs at the onset of your building project allows the design of stair, rail, elevations, landings, winders, and path of walk solutions to meet current rail and baluster building codes. Correct solutions will then be applied and built into the framing thereby eliminating costly tear-outs and re-works later in the time line. Excellence integrated by design. 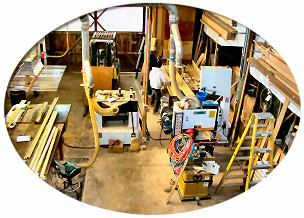 Our stairs are built in our shop from hand selected hardwoods. We custom plane and saw all lumber to assure that all treads, skirts and risers are matched for grain and color. We never use mass produced "off the shelf" treads and risers. We work with architects, builders, and home owners to assist in the design and building of some of the most beautiful stairs on the central coast from San Francisco to Big Sur. We have a large portfolio including stairs and rails in domestic and imported hardwoods as well as locally grown selectively harvested domestic exotics. The lowest bid is not always the best value! In this age of rising construction cost we realize what really counts is the bottom line. We all have to live with this reality. We also understand that the first things to go can be service, quality and skilled knowledgeable employees. All of our rails are lag bolted and plugged to their posts. All rails and fittings are attached with rail bolts not clamp nails. Because of the complexity of many stair and rail projects, we feel that it is important to list all parts and their corresponding numbers and sizes so that accurate comparisons can be made. At Central Coast Stairs we understand that we cannot always provide the lowest bid, but we are sure that we can always provide the best value. We are proud of the furniture grade staircases and rails that we provide at extremely competitive prices. If you have any questions regarding parts, prices or policies, please do not hesitate to call us. We look forward to the opportunity to be of service to you. Please feel free to call and discuss your needs and let us provide you with a bid on your project. 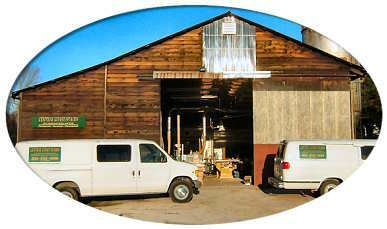 Visit our shop at 5877 Graham Hill Road in Felton, California, located next to historic Roaring Camp Railroad. Our hours are Monday through Friday 7:00 a.m. to 3:30 p.m. and Saturdays by appointment.